A prominent Brierley Hill building which has stood empty for more than five years is to get a new lease of life as an apartment complex. The Point North Waterfront building was previously a headquarters for finance firm Egg, but owners have struggled to create a new future for it since the credit card company pulled out. The West Bromwich Building Society was due to relocate its headquarters and 500 staff to the six-storey offices, but pulled out in 2012. Now Seven Capital is turning it into homes, after buying the property from Richardson Capital, the company behind the Merry Hill shopping centre. The deal is particularly well timed, with the ownership of the Merry Hill centre changing hands, and Intu Properties taking over. Seven managing director Phil Carlin said he felt the location could make the development the most sought-after in the Black Country. He said: “The setting was a big selling point, and so was the quality of the existing build. “We are really confident about this particularly given the number of buyers already lined up to acquire the first phase. We think it is going to be seen as the premier residential apartment scheme in the Black Country. Point North offers a total of 140,982 sq ft of development space. Planning permission has been secured under “permitted development rights” – which allow faster permission in converting office to residential use – for 181 apartments. The building has remained unoccupied since Egg sent its call centre operation overseas. 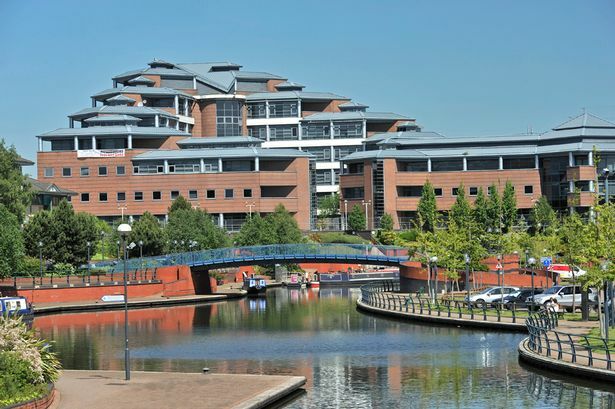 However, with Intu buying Merry Hill for £407.7 million, Birmingham Office Market Forum chairman John Griffiths believes the Waterfront could be set for a renaissance. “This is a landmark building with enormous potential,” he said. “It is very high profile – overlooking a heritage canal basin and near to Europe’s biggest shopping centre.